Christina Kooiker’s story is a love story. Well, actually, two love stories. The first is one of romance, which began when Christina, a woman from Ukraine, fell in love with a Dutch man who would one day become her husband. Because of him, she traveled to the Netherlands and got to know its capital, Amsterdam. Eventually, she moved there to be with him. Christina had used an old film camera while she was in university — admittedly, because she couldn’t afford a digital one. 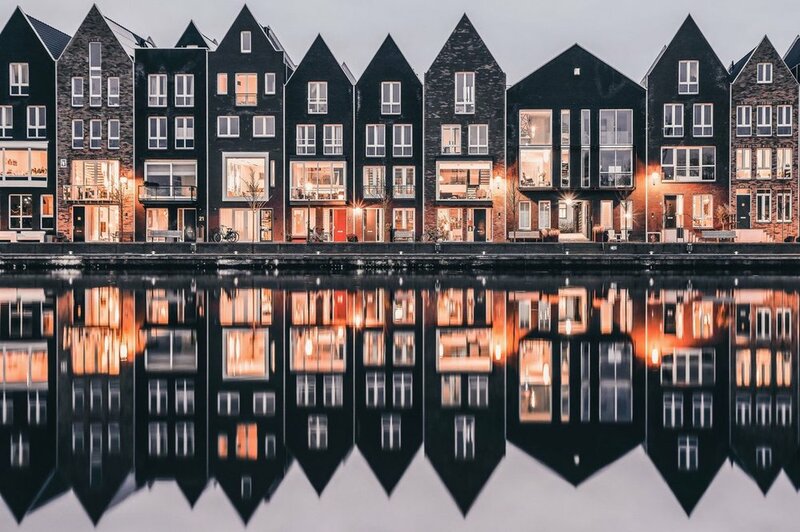 But when she moved to Holland, she turned to Instagram to share the photos she took while exploring her newly-adopted city. While capturing the angles, modern architecture, and street scenes in Amsterdam, Christina came into her own photographic style. She grew comfortable manipulating the settings and functions on her new digital camera. That’s where the second love story begins — an affair with reflections. Christina was enamored with the way the evening lights flickered and reflected in the city’s watery canals. They never looked the same, a feature she found simply magical. So she experimented with long-exposure photographs of the shimmering reflections. She’s been smitten ever since. On her Instagram feed, Christina tries to convey the best perspectives and angles of the cities she visits. She knows that each place has something different and unique to offer, and she finds inspiration in using her favored technique in every new location. She’s traveled around Holland, through France and Germany, to Prague and back to Ukraine, and even as far as Seoul, South Korea. But in each destination, she keeps the same phrase in mind. Christina knows that photography, life, and travel itself are all about how you view things. It all comes down to perspective, to seeing all the angles and knowing that everything has more than one side — just like her enchanting reflective photos. For Christina, being a photographer means acknowledging that there are as many different perspectives in the world as there are people, and that hers is wholly unique. This is how Christina’s double love story draws to a close, though not to an end — with the sharing of her mesmerizing perspective of the world, one that she found thanks to real-life love for a man from Amsterdam. 5 Screenwriting Lessons from Guillermo del Toro & "The Shape of Water"